If holiday guests are on the way and you need to get things clean quickly, pressure washing is the perfect way to do so. 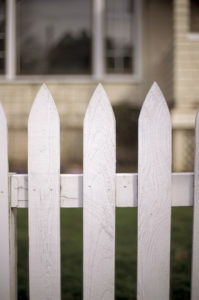 Is your fence looking a little bit worse for wear? If holiday guests are on the way and you need to get things clean quickly, pressure washing is the perfect way to do so. Pressure washing is also an awesome way to ensure the longevity of your fence. Here are some of our best tips for pressure washing your fence! How Dirty Are We Talking? Your fence is dirty, but how dirty? If your fence is dirty, has peeling paint, or is still holding onto patchy old wood stain, simple water will almost always knock it all off. However, tough stains or mold will need extra work. Mix together a cleaning solution of a gallon of water, ¼ cup of a mild laundry detergent, and ¼ cup of bleach. Always test this solution on a small patch of your fence before you use it over the entire surface. Now, it’s time to get started! Choose the right tip for your pressure washing. If you want a concentrated, high pressure blast, you should use a lower degree tip. If you want a slower and wider spray, like for rinsing, you should choose a higher degree tip. Next, grab your cleaning solution and start cleaning! Check all of the connections of your pressure washer and stand about 3-4 feet from the fence. Spray the pressure washer in long lines from top to bottom. You should follow the grain of the wood as you spray. Once you spray the entire thing, you should go back over the bottom to knock off any excess dirt. If your fence is still dirty, you should use the cleaning solution in your pressure washer again, followed by another rinse. Don’t be afraid to go back over the fence a few times if things are built up! This entry was posted on Friday, December 15th, 2017 at 12:32 pm. Both comments and pings are currently closed.